It has been a busy week, my Dad and I have been sorting out for scanning. We scan sheep to find out how many lambs are inside them. We do this by using an ultra sound which is the same idea as a woman being scanned when she is pregnant. We pay a contractor to come and scan all of the sheep. Once we know how many lambs the sheep have in them they are fed accordingly, as the ones with triplets have to be fed a lot more than those with singles. The singles don’t need feeding as much, as the lamb would grow too big and the sheep would be unable to lamb them. It is important to feed the twins and triplets well, as if they aren’t looked after right they cannot rear the lambs because they would not have sufficient milk. The sheep with triplets need feeding hard because in the last two weeks of being in lamb we cannot feed them enough as the lambs take a lot out of them. All the sheep need to be gathered up in time for scanning, with the flocks brought down from higher allotments to the fields near the sheep pens to sort out the different flocks. It is important to keep an eye on how many ewes have been tupped (mated). 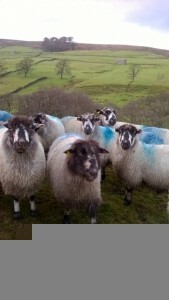 We have five separate flocks of Dalesbred sheep and one flock of Mashams. Dad gathered one allotment down to the pens for us to sort out the sheep which have been tupped by different tups (rams). Using a raddle, which is just a coloured crayon strapped to the tup’s chest, helps us to do this. Each tup has a different colour of raddle so that when they lamb we know which lambs are by which tup. After 17 days the tup’s colour is changed to black so that we can check that the tups are working and that the sheep are holding to that tup. The sheep with the blue, orange and the shearlings (a shearling is a young ewe that has been clipped once) with yellow raddle marks had to be separated from the other yellow ones. We scanned the yellow raddled sheep as they are due to lamb from the 20th March, whereas the other colours in that flock will not lamb until the 10th April. We have the lambing spread out because if the weather turns bad we might have to fetch the sheep inside when they are lambing and we wouldn’t have room for all the sheep at once. The Masham ewes scanned well; there was one quad (four lambs!) which was a surprise. They scanned at 187% which was about average for them. (The lambing percentage is all the lambs inside the sheep which were scanned divided by the number of sheep.) There was only 5 geld which will be rescanned next time the scanners come to scan the other flocks as they were raddled later than the rest. A geld sheep is a sheep that has no lambs inside it. The other flock which we call the ‘Insiders’ scanned really well, they were up 25% on scanning percentage from 143% last year to 168% this year. Whilst my Dad and uncle were scanning them I took the Masham ewes back to the field where they were from. I took the sheep back to the field by driving them back with the dogs, Tip and Susie. By the time I had got back to the sheep pens they had finished the insiders and were on with the last packet `Bracken ridge` sheep. Bracken ridge sheep scanned up slightly compared to last year too. Given these results, it seems likely that we’ll have a very busy lambing season ahead!